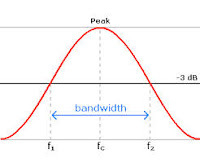 Bandwidth is broad or wide frequency range used by the signal in the transmission medium. Within this framework, the bandwidth can be defined as the difference between the high-frequency signal components and low frequency signals. Signal frequency is measured in Hertz. A typical voice signal has a bandwidth of about 3 kHz, analog broadcast television (TV) has a bandwidth of about 6 MHz. In the computer networks, bandwidth is often used as a synonym for data transfer rate is the amount of data that can be taken from a point to another within a specified period (usually within seconds). Type of bandwidth is usually measured in bps (bits per second). Sometimes also expressed in Bps (bytes per second). A modem that works at 57.600 bps has twice the bandwidth of a modem that works at 28.800 bps. In general, the connection with large bandwidth / high enables the delivery of information such as sending pictures / images in a video presentation.